I teach at several preschools and elementary schools, so I decided to try teaching kids ages 3 to 5 outside. I first had to establish rules and guidelines, but also let the kids have fun with being outside and enjoying nature. 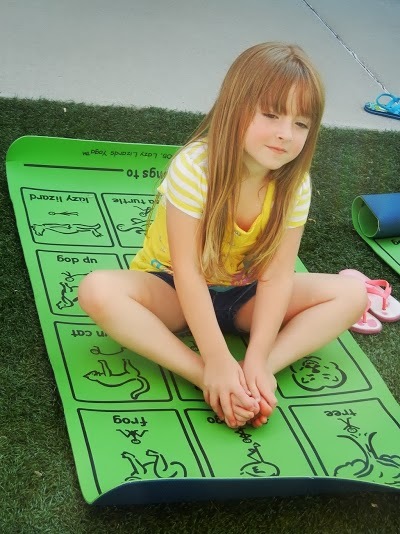 Here’s 5 tips to bring your kids yoga class outside, whether you are a teacher, parent, or grandparent. 1. Establish the “rules” first. Let kids know their boundaries, a yoga mat is a great way to create a boundary, let the kids know they have to stay on their yoga mat, it is their space, unless you tell them that they can come off of their yoga mat. 2. Use your surroundings, the grass, the sounds, the sun, the flowers, maybe even a few bugs come the kids way. Use it as a learning experience. The first time I taught my group outside, things were going great, but then a spider came onto one of the little girls mats. Chaos ensued for a little while and class turned into a learning experience about spiders, how we shouldn’t hurt them, they were just passing our way, I also told the story how my Mom told me if I killed a spider it would rain for 7 days. Do you want it to rain for 7 days? What would a spider yoga pose look like? And everyone took a turn. Where would you go if you were a spider? Use the chaos as an opportunity, if it may come. 3. Practice yoga poses that have to do with summer and nature. Sunflower pose as a group pose is great one. Have all the kids sit down with their legs out in front, feet touching, and have them reach for their feet, explain how the sun flower opens and blooms with the sun, as they stretch their bodies out long and into the grass, have them close up the sunflower by reaching for their feet again. The kids love this one, they usually will ask to do it over and over again. 4. Have the kids close their eyes and listen to the sounds outside. Let them share their findings after their “quiet” time. You may be surprised with what they come up with. I have heard everything from cars to robots. Filed under Activities, Holiday Yoga, Kids Yoga, Kids Yoga Poses.